^ 1958-, Berg, Jeremy M. (Jeremy Mark), (2012). Biochemistry. Tymoczko, John L., 1948-, Stryer, Lubert. (7th ed ed.). New York: W.H. Freeman. ISBN 9781429229364. OCLC 758952268. https://www.worldcat.org/oclc/758952268. ^ L., Lehninger, Albert (2000). Lehninger principles of biochemistry.. Nelson, David L. (David Lee), 1942-, Cox, Michael M. (3rd ed. ed.). New York: Worth Publishers. ISBN 1572591536. OCLC 42619569. https://www.worldcat.org/oclc/42619569. ^ Reeds, P. J. (2000-7). 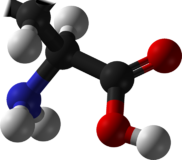 “Dispensable and indispensable amino acids for humans”. The Journal of Nutrition 130 (7): 1835S–40S. doi:10.1093/jn/130.7.1835S. ISSN 0022-3166. PMID 10867060. https://www.ncbi.nlm.nih.gov/pubmed/10867060. ^ a b Institute of Medicine (2005). “10. Protein and Amino Acids”. Dietary Reference Intakes for Energy, Carbohydrates, Fiber, Fat, Fatty Acids, Cholesterol, Protein, and Amino Acids. The National Academies Press. pp. 593(Table 10-1). https://www.nap.edu/read/10490/chapter/12#593. ^ Kozlowski, Lukasz P. (2017-01-04). “Proteome-pI: proteome isoelectric point database”. Nucleic Acids Research 45 (D1): D1112–D1116. doi:10.1093/nar/gkw978. ISSN 1362-4962. PMC PMC5210655. PMID 27789699. https://www.ncbi.nlm.nih.gov/pubmed/27789699. ^ Khoury, George A.; Baliban, Richard C.; Floudas, Christodoulos A. (2011-09-13). “Proteome-wide post-translational modification statistics: frequency analysis and curation of the swiss-prot database”. Scientific Reports 1. doi:10.1038/srep00090. ISSN 2045-2322. PMC PMC3201773. PMID 22034591. https://www.ncbi.nlm.nih.gov/pubmed/22034591. ^ Donald., Voet, (2006). Fundamentals of biochemistry : life at the molecular level. Voet, Judith G., Pratt, Charlotte W. (2nd ed ed.). New York: Wiley. ISBN 9780471214953. OCLC 58845396. https://www.worldcat.org/oclc/58845396. ^ Miller, S. L. (1953-05-15). “A production of amino acids under possible primitive earth conditions”. Science (New York, N.Y.) 117 (3046): 528–529. ISSN 0036-8075. PMID 13056598. https://www.ncbi.nlm.nih.gov/pubmed/13056598. ^ Miller, S. L.; Urey, H. C. (1959-07-31). “Organic compound synthesis on the primitive earth”. Science (New York, N.Y.) 130 (3370): 245–251. ISSN 0036-8075. PMID 13668555. https://www.ncbi.nlm.nih.gov/pubmed/13668555. ^ Leuchtenberger, Wolfgang; Huthmacher, Klaus; Drauz, Karlheinz (2005-11). “Biotechnological production of amino acids and derivatives: current status and prospects”. Applied Microbiology and Biotechnology 69 (1): 1–8. doi:10.1007/s00253-005-0155-y. ISSN 0175-7598. PMID 16195792. https://www.ncbi.nlm.nih.gov/pubmed/16195792.